The specter of Hulkamania had already fallen at his feet. He had beaten back the consuming Madness that was Randy Savage. He had even played a game of chicken with Vince McMahon and came out the other side the victor. What, then, could have proven to be a threat in the chaotic world of The Ultimate Warrior? What force of this earth or even this universe could bring the man from Parts Unknown to his knees in the throes of debilitating sickness? Only the mysterious and enigmatic power of Black Magic has the ability to accomplish such amazing feats. Through the nefarious flesh and bones of Papa Shango, the dark forces of the shadows set their aim on the bearer of light in the World Wrestling Federation, and would not relent unless the Warrior was fell before their alter. As The Ultimate Warrior sprinted to the ring in the midst of the sixty thousand people congregated at Wrestlemania VIII to save the man he knew as Hoke Hogan from the clutches of Sid Vicious and Papa Shango, little did he know that he would also be plunging his own life into an all-consuming darkness. Not long after that fateful night in Indianapolis, the Warrior would find himself basking in the glow of victory and the adoring fans like he had many times before. This time, however, that glow would not last very long as the voodoo master would slink his way down to the ring and shake his skull-adorned staff at the once triumphant hero. Clutching his stomach, Warrior fell from the apron, and after a long period of convulsions, he eventually was forced to vomit by the sinister forces that now resided deep within his vessel. Worried fans across the globe wondered whether Warrior could conquer someone with such power. With fingers held tenuously between chattering teeth, all the millions of warriors wondered if this could be the Warrior’s final stand? This anxiety that permeated throughout the WWF fan base was not put to ease the next week in the least. 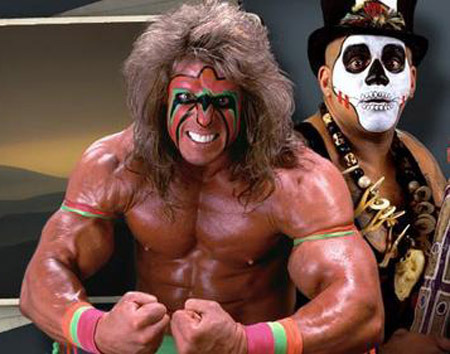 After speaking to “Mean” Gene Okerlund and delivering a motivational speech that would signal things to come for the man known as The Ultimate Warrior, a grotesque image began to display itself on the brightly painted face of the man who had just tried to diminish the power of Shango with his words. At the height of adrenaline and positivity, a dark substance began to seep out from under Warrior’s hair and ran ominous streaks down his flabbergasted face. In shock, everyone in attendance and everyone with a microphone wondered what this sudden liquid pouring from within this man could be. Could it have been blood? Motor oil? Had Warrior discovered the secret of Machismo before Razor Ramon? Whatever it was, it was indeed a sign to all those who graced the ring that they could never be safe from the influence of one Papa Shango. Not even announcers could feel secure.